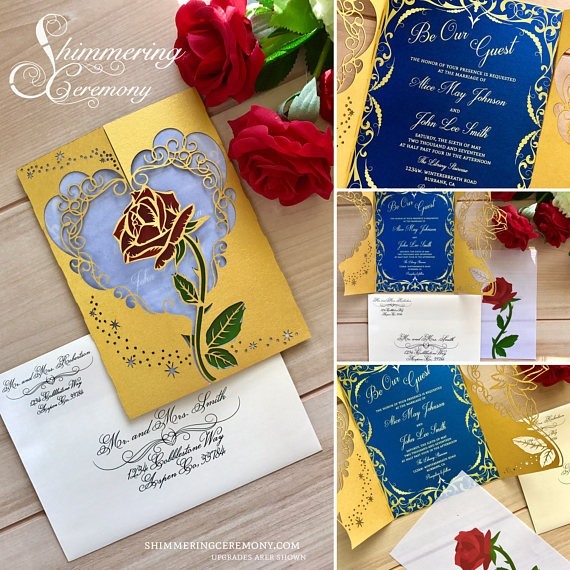 Today’s Top 5 Invite Post has me builds on previous invite style posts, to give you a few amazing examples of a wedding theme that has become quite popular thanks to the Disney movie of the same name: Beauty and the Beast! 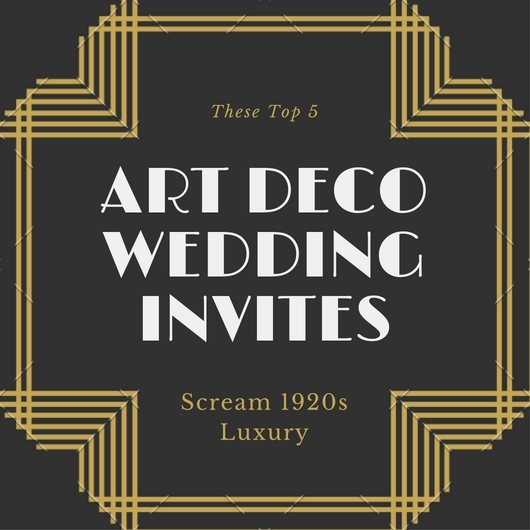 Expect to find many of the same loveable characters like Mrs. Potts or Lumière as decor item inspiration for your themed wedding, a single red rose under glass, along with the color schemes of blue and gold. We’re definitely Disney fans and grew up on stories like Cinderella, The Little Mermaid, and Beauty and the Beast (BATB). It is no surprise that this theme strikes a cord with so many couples in 2018 and beyond, as they try to capture the essence of a fairytale story about love and plan a wedding around it. With that in mind, let’s take a look at our top 5 invites to set the tone for your Beauty & the Beast themed wedding day! Naturally, we had to draw inspiration from all the hit tunes of the Disney movie to integrate into this post. I’m sure you’ll try to use a few one liners from the movie on your invites too! 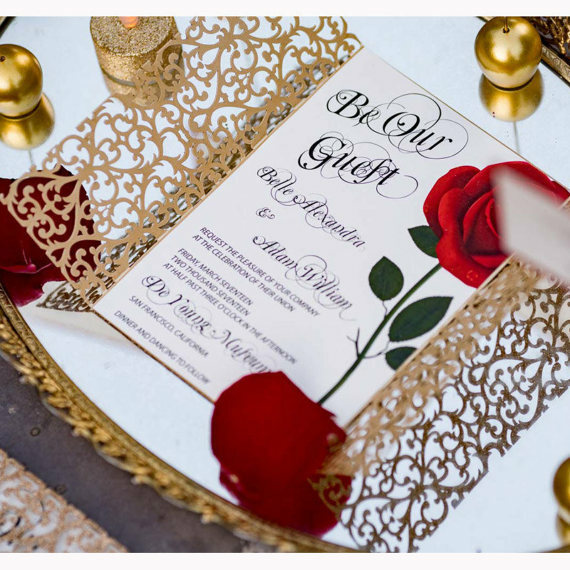 Beauty and the Beast themed wedding stationery should exude a sense of elegant playfulness. A color palette of vivid gold, royal blue, and red with a white background is an appropriate color combination. 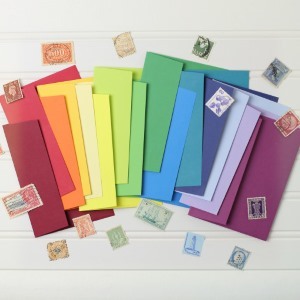 Usually we don’t recommend more than two or three colors maximum for stationery, but BATB really has some amazing colors that should be seen and celebrated. A talented artist from Florida came up with this magical gatefold invite design. 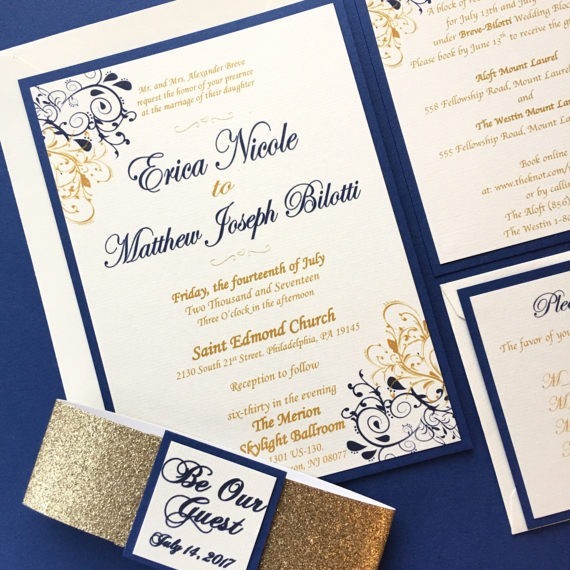 An elegant themed wedding deserves a gold and royal blue invite with laser cut details. 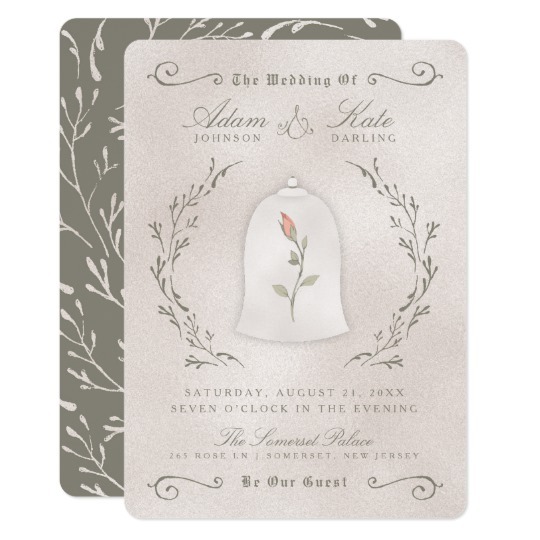 We just love the look of this invite — truly fit for the type of fairytale wedding you are trying to achieve. 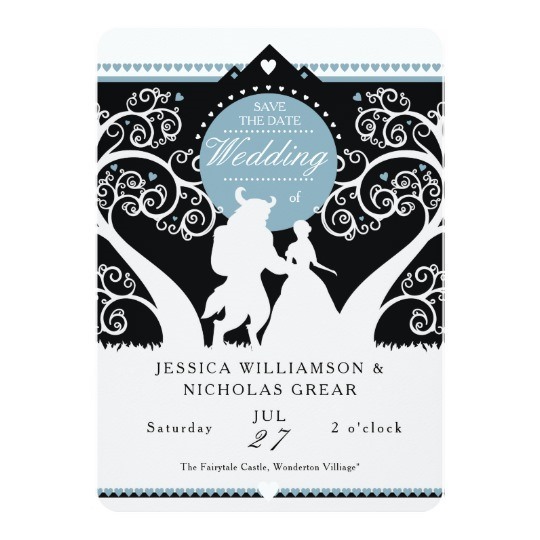 We had to include this whimsical silhouette of both Belle and the Beast as one of our top Save-the-Date picks. The white silhouette on black works well with the light shade of blue and the hearts to create a lovely pattern. We took a lot of inspiration from this styled shoot we featured back in September, which provides amazing inspiration for many facets of a Beauty & the Beast wedding theme. And so you may notice the above invite featured within that shoot! The delicate gold gatefold and elegant script font provides a complete visual experience. Be aware that some reviews on Etsy indicate the gold paper is thin and tears easily. BELLE: If you’d hold still, it wouldn’t hurt as much! BEAST: Well, if you hadn’t have run away, this wouldn’t have happened. BELLE: If you hadn’t frightened me, I wouldn’t have run away! BEAST: Well, you shouldn’t have been in the west wing! BELLE: Well, you should learn to control your temper. Now, hold still. This might sting a little. By the way, thank you…for saving my life. The popular curated seller of handmade goods (Etsy) has a lot of different Beauty and the beast design options at price points that won’t break the bank. Downloadable files mean you can print at home, or get a local printing company to help you out. 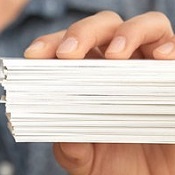 Some Etsy vendors do offer a complete printing package if that is the route you want to take. We encourage you to browse over 300+ designs and see if one catches your eye! We’ve already pointed out a few above, from highly rated sellers that really capture what Beauty and the Beast wedding style is all about. A gold and sapphire blue design accented by a lovely floral pattern — certainly chic and glamorous looking! The gold glitter band with words, “Be our Guest” hints at the fact that you’re throwing a BATB themed wedding. We picked this final design for its versatility and muted tone. The rose graphic hints at a Beauty and the Beast theme, but can be used for many different styles. Sometimes you don’t want to go “all-in” with over the top color of blues/golds, and this invite lets you craft a more rustic and earthy inspired wedding. We’ve got a couple of amazing styled wedding examples that really showoff a Beauty and the Beast theme into your real wedding. A superbly executed styled shoot portraying Belle in a yellow gown alongside her Prince really captures the fashion and fun of this theme. In addition, a more whimsical example has a styled wedding held in a very appropriate venue — a castle!